Here Father Rydzyk had to pause: he was live-broadcasting these remarks to an audience in a church via a closed-circuit link, and everyone had started laughing. Who voted for that? I can even see girls laughing at this, and quite right. After all, who’s ever seen something like that? A girl with a beard. Maybe it just stuck to her. But look, that is so abnormal – we understand that. And we laugh at it, because it is so laughable. Or would be, if it weren’t so tragic. Truly, Radio Maryja represents the sort of outmoded religious values that find no sympathy with me. But does that mean that I posted Father Rzdzyk’s remarks to mock them? Not at all; on the contrary: well said, Father! As this article in Flanders’ De Morgen that came out immediately after Eurovision put it, who tunes into Eurovision anymore looking for a good tune? Some of us – most of us, I would think – actually believe in music, rather than the sort of provocative shock-cabaret that Eurovision has become. Ms. Wurst’s Eurovision triumph was also timed very unfortunately from a geopolitical standpoint. What better confirmation could have been provided to Russian – and East Ukrainian – politicians who have been trying to paint Europe as a depraved civilization? Now, I don’t believe that is accurate; probably Father Rzydyk is not even willing to go that far. But this is a matter of competing perceptions in a propaganda war, and Europe just shot itself in the foot. 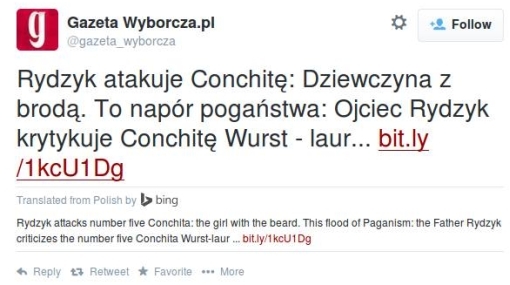 PS: It now looks like Twitter has made a deal with Microsoft to have the Bing Search Engine provide translations to tweets that are not in English. 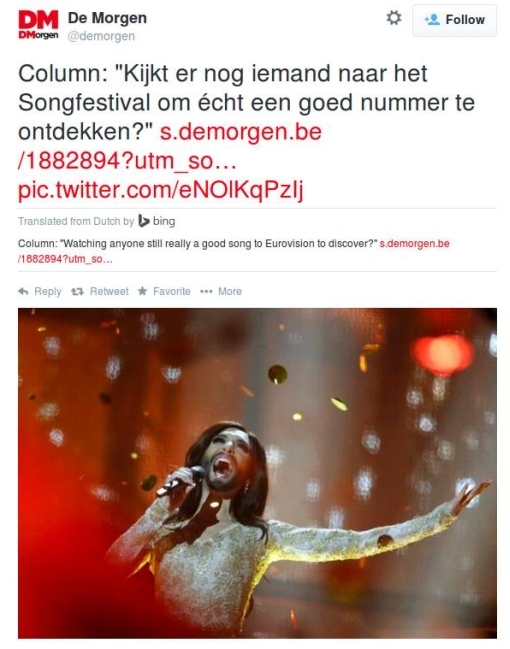 So check out that last De Morgen tweet: How do you like your “Watching anyone still really a good song to Eurovision to discover”? Or the Gazeta tweet up top: I have no idea where the Bing software is getting all those “number fives”! Is that code for “girl with beard”?